This onesie is silk screened on the front and on the Bum. 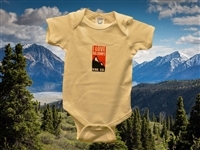 The onesie is 100% cotton and is sized in the month scale starting at 6 months going up to 24 months. A great Colorado logo with mountain design. Navy and graphite printed on 100% cotton. Royal printed on a cotton/polyester blend. A fun mountain take on the classic Batman logo. 100% cotton. Aint nothing better than a big dump out here in the mountains! A great gift for any new parent. 100% brushed cotton for a super soft, no rub feel. This is one of our most popular youth hoods. It is sized in the youth scale starting with youth small to a youth large. This hoodie is 50% cotton and 50% poly. This hood comes in seven different colors and have this same hood in adult sizes. 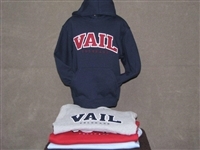 Soft and stylish hoodies with a two layer embroidered applique. 80% cotton/ 20% polyester.